As I reported earlier, I am a volunteer for Fix the Debt, the outreach arm for the Washington DC think tank, Committee for a Responsible Federal Budget. I recently attended a workshop in D.C. put on by Fix the Debt and, in return, I have agreed to make presentations about our debt problem to local organizations during the coming year. Today I gave my first such talk to a local Kiwanis Club. Lower Wages and Fewer Job Opportunities. The growing debt “crowds out” productive investments in people, machinery, technology and new ventures. 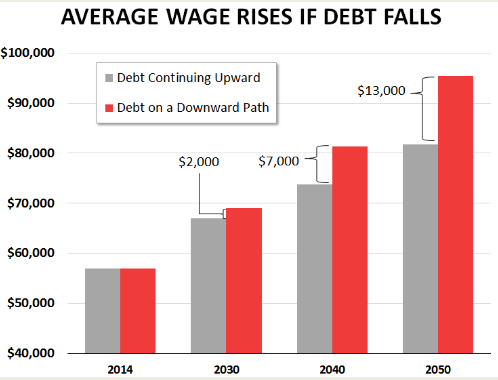 For example, the Congressional Budget Office estimates that the average wage in 25 years will be $7000 lower if debt is on an upward path compared to a downward path (see above chart). Increased Costs of Home, Auto, Student and Credit Card Loans. Although interest rates are currently low, they will almost certainly rise as the economy recovers, and they will rise much higher if debt continues to grow. Less Room for Investment in Infrastructure, Research, and the Next Generation. The CBO projects that interest costs will nearly quadruple from $220 billion in 2013 to $800 billion in 2025. By 2030, 100% of all revenue will go towards interest payments and mandatory spending. A Threatened Social Security Net. Both Social Security and Medicare are on a road to insolvency. By 2033 both Medicare’s hospital insurance trust fund and the Social Security trust fund will run out of money. An Increased Likelihood of a New Fiscal Crisis. If investors lose confidence in our ability to service debt, there will be tanking markets, sharply rising interest rates, mass unemployment and rapid inflation. A Missed Opportunity to Grow the Economy. Debt reduction, tax reform and modest entitlement reforms have the potential to increase economic growth by 9.5% by 2035. Think of all the new jobs this would create! Do you belong to a club or other civic organization in metro Omaha which brings in outside speakers? If so I’d be happy to bring Fix the Debt’s message to your group. Shoot me an email at jackheidel@yahoo.com! This entry was posted in Committee for a Responsible Federal Budget, debt, deficit, financial crisis, fiscal crisis, Fix The Debt, Jack Heidel and tagged debt, deficit, Deficit spending, economic growth, Fix The Debt, jack heidel, tax reform by jackheidel. Bookmark the permalink.